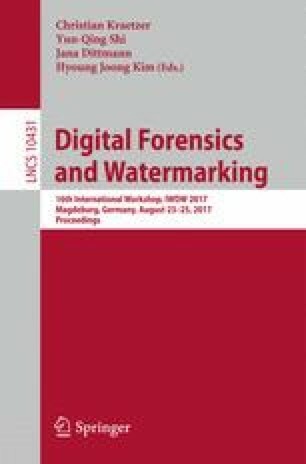 This paper introduces a topological approach to detection of image tampering for forensics purposes. This is based on the emerging Topological Data Analysis (TDA) concept of persistent homological invariants associated with certain image features. Image features of interest are pixels that have a uniform Local Binary pattern (LBP) code representing texture feature descriptors. We construct the sequence of simplicial complexes for increasing sequence of distance thresholds whose vertices are the selected set of pixels, and calculate the corresponding non-increasing sequence of homology invariants (number of connected components). The persistent homology of this construction describes the speed with which the sequence terminates, and our tamper detection scheme exploit its sensitivity to image tampering/degradation. We test the performance of this approach on a sufficiently large image dataset from a benchmark dataset of passport photos, and show that the persistent homology sequence defines a discriminating criterion for the morphing attacks (i.e. distinguishing morphed images from genuine ones). Authors would like to thank Dr. Andrey Makrushin for providing morph images and discussions about morph techniques.